Singing has many, many benefits to our overall wellbeing, and singing in a community provides even more. Read some interesting articles that explain this in more detail. Choir membership brings with it the challenge to learn a variety of styles, memorise some music, and blend with a diverse group of people. While an element of discipline is expected in relation to punctuality, practice and organization, these are outweighed by the satisfaction of performing in the ensemble - "a whole that is greater than the sum of its parts". Vocalize is designed to be a choir that sings for the joy of it. If you are interested in joining Vocalize please download our 2019 Member Info Sheet and fill out a 2019 Membership Form. Yes, we welcome anyone (16+) who would like to join us! No experience or audition necessary, and the ability to read music is not a requirement. 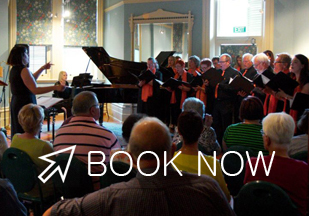 New members are given the opportunity to try Vocalize out for two weeks before being invited to join as full members. As a newcomer you are welcome to join in the singing or just sit and observe if you prefer. We sing all kinds of repertoire, mostly using sheet music but not always. We enjoy vintage pop (60s-80s), jazz, musicals, rock and contemporary pop, classical choral music, as well as seasonal Christmas music, just to name a few. We rehearse weekly – Monday nights 7:00-8:30pm. The venue is Faith Lutheran Church, 2 Ailsa Avenue Warradale. Parking is available on the street or in the carpark to the rear of the building. What are your rehearsal dates? Vocalize rehearsals follow the SA 2019 school term dates*, as follows. *Please note, we don't rehearse on public holidays. What do I do when I turn up for the first time? When you first arrive please visit the table by the door and write your name in the attendance book. The choir Secretary will welcome you, issue you a name tag and introduce you to a Section Leader who will buddy you up with another singer. Your buddy will share their music for the night and help you along the way where needed. Doors open at about 10 to 7 – we start at 7p.m. sharp with a 15 minute warm up. If arriving late please come in quietly and take your seat. We endeavour to keep unnecessary talking during rehearsal to a minimum so we can get through a lot of music. What should I bring to rehearsal each week? No you are not required to be able to read music, however, it is certainly advantageous in learning the music. Our Help Sheet is available to assist in explaining some of the musical terminology and symbols. Am I expected to attend every rehearsal? Regular attendance is helpful for everyone. We realise that some members are unable to attend every week due to other commitments; all we ask is that you attend on a regular basis. It can be difficult to catch up songs if too many rehearsals are missed. Vocalize Choir offers a handful of performances each year, with varying degrees of preparation required. It is not compulsory to perform if you would prefer not to, or you are unavailable. However each performance requires a minimum number of singers so if you commit to a performance we ask you to honour your commitment.